Enumerate computers is a tool to enumerate computers in a domain. Depending on enumeration parameters the tool can work in different ways. It can enumerate all computers ( if All Computers is selected ), all SQL servers only (if Microsoft SQL Servers is selected ), all primary domain controllers only ( if Primary domain controllers is selected ) , backup domain controllers only ( if Backup domain controllers is selected) , primary domains only ( if Primary domains is selected ),etc. You can enumerate different server types by selecting more than one type. 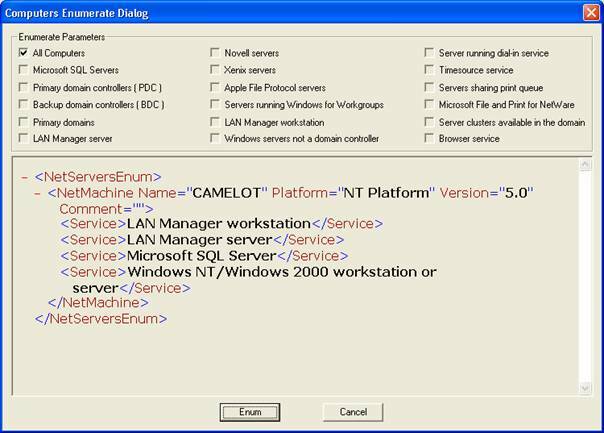 To start the process select the server types you want to enumerate and click on the Enum button. The enumeration results will be displayed in XML format. To close the dialog click on the Cancel button.